Another began to air for the first time in early 2012. The story centers itself around Kōichi Sakakibara who transfers into Yomiyama’s class 3-3. Just before he is formally introduced into his new life his eye is caught by Mei Misaki. Kōichi is considerably intrigued by Mei’s behavior and universal exclusion from everything and everyone around her. Almost as soon as Kōichi begins interacting with Mei the whole class is plunged into strange phenomena. As result students of class 3-3 and the relatives begin to die in vicious manners. It falls onto Kōichi and Mei to try to find a way to break the curse before anyone else gets hurt. It soon comes to light that these current events may share a connection to similar events of the 1972 class 3-3 and almost every subsequent class thereafter. 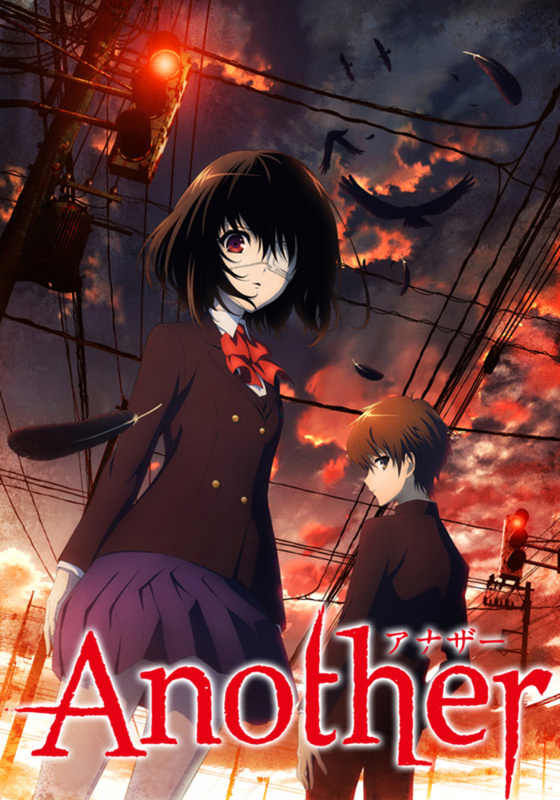 My Review: I really love Another, for me, it has just the perfect mix of gore and psychological horror. There are quite a plethora of very bloody and gruesome deaths. What I thought really let down the show was its ending, there were just too many questions, also the fact of the events just before the ending meant that the whole thing just felt very lackluster and empty. On the other hand, Another is bursting at the brim with beautiful imagery and enchanting suspense that really pulls one into the world. I also think that there are some very interesting and unique deaths, even if they are a bit unbelievable. Without trying to spoil anything the main idea behind the curse is somewhat uninspired, however, the way in which it affects the class and how it makes them act is something I’ve never seen before. All in all, Another is a very solid anime that I would recommend to anyone who likes blood, guts, and gore. This anime definitely did bail the atmosphere even if the story isn’t the most original.